If you thought the effect was just for 80s ballads, the Corona might just convert you. Large library of TonePrint presets. Good value. Well made. Compact size won't suit all players. We've seen some killer gear from TC Electronic in recent years, but it's the Mini pedals that have really had guitar players talking. 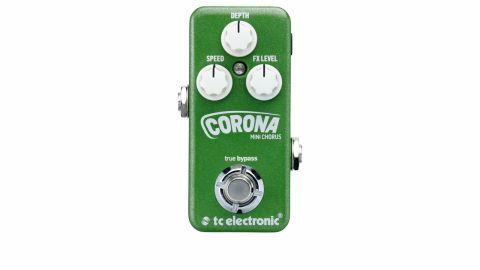 Now, TC has launched four of its flagship pedals in that irresistible bijou format, including the Corona Mini Chorus. "Chorus doesn't get the best rep, but the Corona Mini is perfect for occasional shimmers"
Nowadays, chorus doesn't get the best rep, but the Corona Mini is perfect for occasional shimmers. Complete with USB connection and an ace up its sleeve in the form of TC Electronic's ingenious TonePrint system, which allows you to 'beam' new presets from your iOS/Android phone, the Corona can use one setting at a time, but has a vast collection of presets at its disposal. Its TonePrints cover sounds from subtle thickening (John Petrucci's Rush-esque Crunch Chorus) to extreme (Munky's deep Drowning Chorus), while the analogue dry-through keeps your raw guitar tone intact - ideal for A Perfect Circle-style distorted chords and warbly rotating speaker-ish solos.